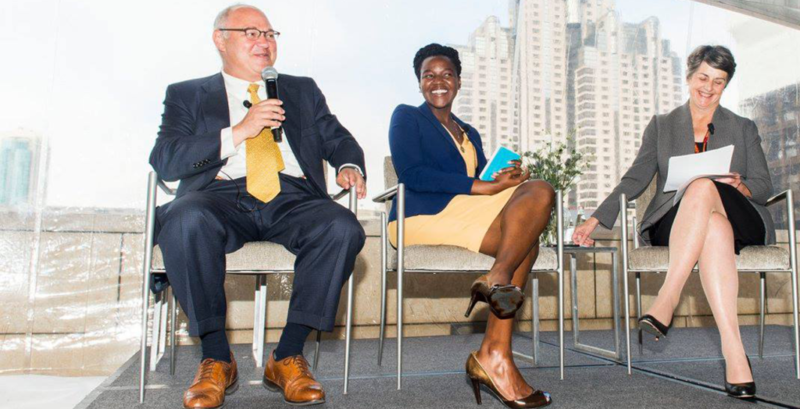 Provost Maria Pallavicini represented University of the Pacific on June 6 at UpdateSF 2017, the rebranded economic forecast and jobs forum in San Francisco. The event drew a sold-out crowd of more than 250 leaders from business, health care, education, public policy and more. Pacific’s presence offered a significant opportunity to raise the University’s visibility with Bay Area leaders. Provost Pallavicini opened the event with remarks on the importance of an educated and prepared workforce and moderated a panel discussion with Wells Fargo Senior Economist Mark Vitner and LinkedIn’s Head of U.S. Public Policy Nicole Isaac, looking at the region’s economic trends and workforce needs in light of education, public policy and politics. In her remarks, Provost Pallavicini discussed how Pacific is working to meet the workforce needs of the San Francisco Bay Area and the Northern California region through its programs on all three campuses. Vitner spoke on the latest economic trends and Isaac discussed how using data can help us adapt to changes in the global workforce. SF Chamber of Commerce President and CEO Tallia Hart also discussed how the SF Chamber and the San Francisco Center for Economic Development work to strengthen the economy of San Francisco. In her remarks, Provost Pallavicini discussed how Pacific is working to meet the workforce needs of the San Francisco Bay Area and the Northern California region through its programs on all three campuses. Several other Pacific representatives from various programs across the University were in attendance, including Dr. Nader A. Nadershahi ’94, dean of the Arthur A. Dugoni School of Dentistry, and Dr. Richard Fredekind, executive associate dean.